The US Air Force has announced that it is interested in a "Reusable Booster System" (RBS) - a combination of rocket and aeroplane which could replace the first stage of existing orbital launch stacks. After the upper stages separated and carried on into space, the winged RBS would glide down to a winged landing for refuelling and subsequent re-use. Studies have suggested that a Reusable Booster System (RBS) could reduce the cost of space transportation by significantly reducing the amount of flight hardware expended to achieve orbit while maintaining a moderate vehicle stack weight and associated development cost ... The architecture consists of a reusable booster that can be integrated with a family of expendable stages to support the full range of [military] payloads from suborbital missions to operationally responsive payloads to heavy-lift missions. There are loads of different ideas around for re-usable first stage boosters. It's already possible to use a modified jet airliner, for instance, to lift a small satellite-carrying rocket rocket up to launch height and speed. There's a similar scheme to launch small satellites from the Virgin Galactic "mothership" jet. 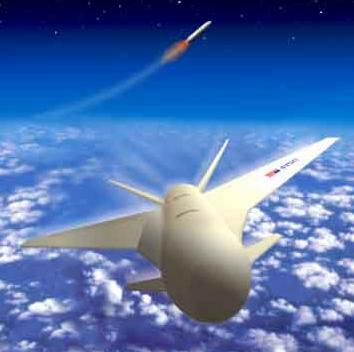 In other ploys, the lower stages might include rocket engines of their own, or super-high-tech hypersonic air-breathing engines - scramjets or things even more exotic. There are even ambitious plans which might one day produce a single craft able to reach orbit from a runway takeoff. Next page: Cheaper than anything good, gooder than anything cheap?